What follows is a description of the framing of different roof sections, building ends and junctions, giving a general indication of the positions and profiles of trusses required to form these sections. The actual number of trusses and the truss types required in any particular roof section depends on the span, pitch and maximum truss spacing for the roof cover used on that roof. The roof designer should begin by identifying the Load Bearing Walls, on which the roof trusses will be supported. Wall Plates are placed on top of load bearing walls to help spread the weight of the trusses evenly over the brickwork. Trusses are bearing on the wall plates and tied down to the superstructure with wire or hoop iron that is built into the brickwork. Trusses are placed perpendicular to the load bearing walls, with their apexes forming the ridgeline of the roof section and their overhangs extending to the eaves lines outside of the load bearing walls. 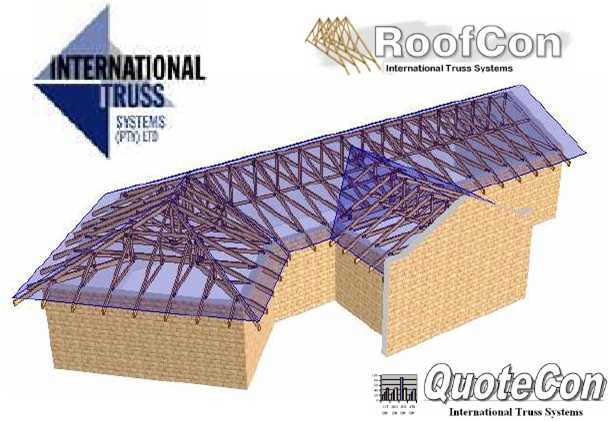 The roof covering is connected to Purlins (for sheeting) or Battens (for tiles), which are small-section timber members securely fixed to the top of the top chords of the trusses with 2.4mm wire ties or system-produced wire connectors. Purlins or battens run horizontally along roof planes, parallel to the load bearing walls, and are normally spaced equally between the ridgeline and the ends of the eaves overhangs. The maximum spacing of trusses is limited by the weight of the roof covering and the maximum distance that the purlins or battens can span. All truss centers – in building ends and junctions, as well as in the straight building sections between them, must be less than or equal to the maximum centers specified for the roof cover. At outside corners of buildings the spacing between the ends of the overhangs should also not exceed the maximum centers.